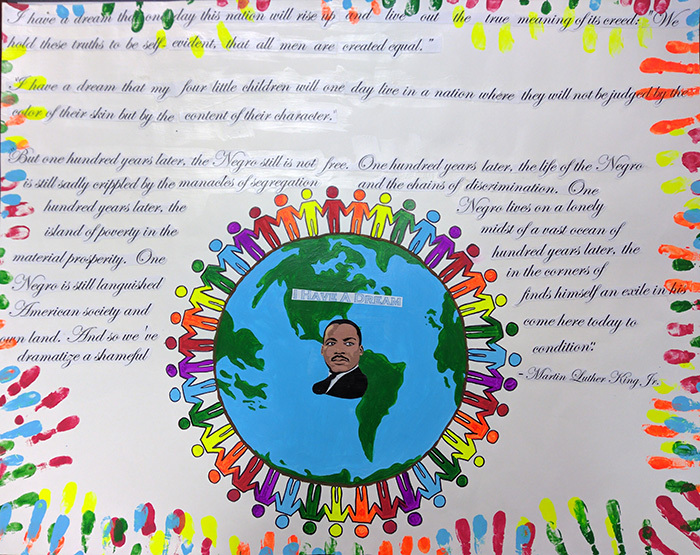 The Black History Month Committee worked diligently to compile a comprehensive list of influencial figures throughout history. Below is a sample of the people they have chosen. 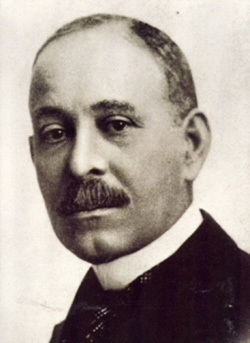 Daniel Hale Williams III was a pioneering surgeon best known for performing in 1893 one of the world’s first successful open heart surgeries. Williams was born on January 18, 1856, in Hollidaysburg, Pennsylvania to Sarah Price Williams and Daniel Hale Williams II. Following the death of his father, Williams lived with family friends in Baltimore, Maryland, and with family in Illinois, from 1866 to 1878 where he was a shoemaker’s apprentice and barber until he decided to pursue his education. In 1878, Williams’s interest in medicine began when he worked in the office of Henry Palmer, a Wisconsin surgeon. In 1880 he enrolled in the Chicago Medical College, receiving a Doctor of Medicine degree three years later. Immediately after graduation Williams opened his own practice in Chicago and taught anatomy at Chicago Medical College. He became a trailblazer, setting high standards in medical procedures and sanitary conditions, including adopting recently-discovered sterilization procedures in regard to germ transmission and prevention. He also avoided the then-common practice of black doctors being barred from staff privileges in white hospitals by starting his own hospital. In 1891 Williams co-founded Provident Hospital and Training School Association in a three-story building on Chicago’s South Side. At a time when only 909 black physicians served 7.5 million African Americans, Provident was the first black-controlled hospital in the nation. Yet Provident was also the first medical facility to have an interracial staff and the first training facility for African American nurses in the US. During Williams’s tenure as physician-owner (1891-1912), Provident hospital grew, largely due to its extremely high success rate in patient recovery: 87 percent. In 1893, Williams daringly performed open heart surgery on a young black man, James Cornish, who had received severe stab wounds in his chest. Despite having a limited array of surgical equipment and medicine, Williams opened Cornish’s chest cavity and operated on his heart without the patient dying from infection. Cornish recovered within 51 days and went on to live for 50 more years. Now nationally recognized, Williams in 1894 was appointed Chief Surgeon at Freedmen’s Hospital in Washington, D.C. As Chief Surgeon, Williams set high standards for doctors from all over the world, who came to witness his operations. He also reorganized Freedmen’s Hospital which had suffered years of neglect, instituting a training school for black nurses, employing a multiracial staff, improving surgical procedures, developing ambulance services, and providing staff opportunities for numerous black physicians. Although he recognized the value of racial integration in the medical field, Williams in 1895 co-founded the National Medical Association (NMA) because black medical practitioners were denied admission to the all-white American Medical Association. In 1898, Williams left the Freedmen’s Hospital, married Alice Johnson, and moved with her to Chicago where he returned to Provident Hospital. Among the numerous honors and awards bestowed on Williams, perhaps the most groundbreaking was his becoming in 1913 the first black member of the exclusive American College of Surgeons. 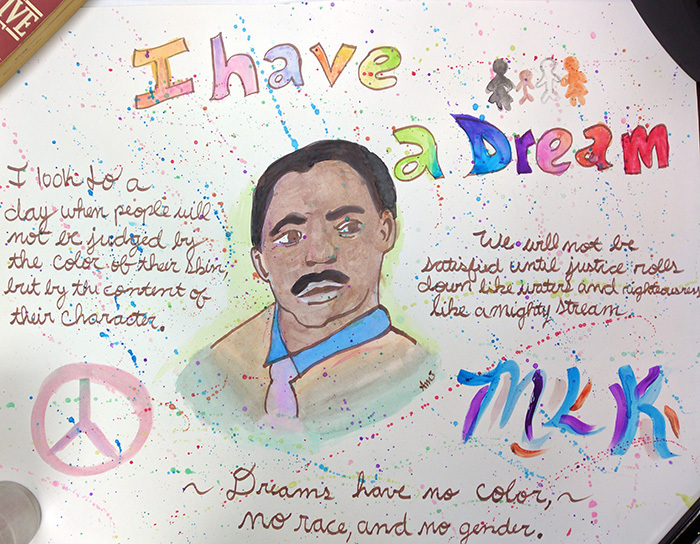 A year after settling in Chicago, Williams became affiliated with Meharry Medical College in Nashville, Tennessee. For the next two decades he was a visiting clinical surgeon. He was also now invited to work at larger hospitals including Cook County Hospital, and at St. Luke’s Hospital on Chicago’s South Side from 1907 to 1926. In 1926, Williams retired from St. Luke’s after surviving a debilitating stroke. He lived out his retirement years in Idlewild, Michigan, an all-black resort community, until his death on August 4, 1931. He was 75 at the time of his death. He left academia to became lab director at Glidden Company. One day in 1939, a water leak in a tank of purified soybean oil created a strange byproduct and gave Julian a surprise insight: the soy sterol that had been created could be used to manufacture male and female hormones, progesterone and testosterone. Progesterone would prove useful in treating certain cancers and problem pregnancies. During World War II, Julian developed a foam from soy protein that could put out oil and gas fires; it was quickly adopted by the military. 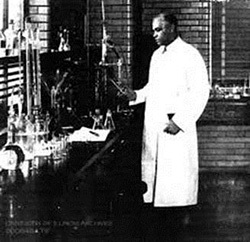 Born in Louisville, Kentucky in 1884, Saint Elmo Brady became the first African American to earn a Ph.D. in the field of chemistry when he completed his graduate studies at the University of Illinois in 1916. The eldest child of Thomas and Celesta Brady, Saint Elmo had two younger sisters, Fedora and Buszeder. Brady studied chemistry at Fisk University in Nashville, Tennessee and earned his B.S. degree in 1908. 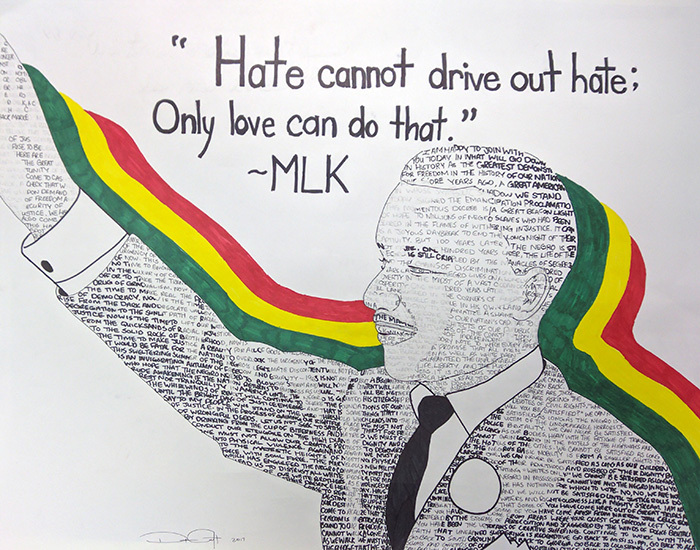 After graduation he accepted a faculty position at Tuskegee Normal and Industrial Institute (now known as Tuskegee University) and was mentored by George Washington Carver and Booker T. Washington, President of Tuskegee. He began graduate studies in the Department of Chemistry at the University of Illinois in 1912, earning his M.S. degree in 1914 and completing his doctorate in 1916. As a graduate student at Illinois, Brady’s research focused on the characterization of organic acids. Brady eventually published three abstracts focused on his graduate work in Science, a prestigious peer-reviewed journal. After completing his doctorate, Brady returned to Tuskegee and continued teaching until 1920. He also served as chair and faculty of the Department of Chemistry at Howard University and Fisk University. Regarding his scholarly achievements, Brady continued collaborative work with the University of Illinois and established a faculty training program focusing on a technique known as infrared spectroscopy, which is used to identify various components in compounds. Moreover, he later published an article focused on the synthesis of a halogen compound with Dr. Samuel Massie, the first African American to join the faculty at the U.S. Naval Academy. Brady's work was important because there was significant interest in halogen compounds being used as insecticides at that time. 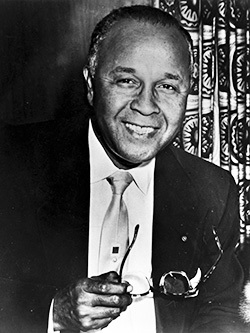 Samuel Massie, who went on to work on the Manhattan Project in World War II, was one of several students that Brady mentored while teaching at Fisk University, thus encouraging African Americans to pursue careers in the chemical sciences. Although Brady officially retired from teaching in 1952, he took a position at Tougaloo College outside Jackson, Mississippi to help develop the chemistry department and recruit faculty. Brady married Myrtle Travers and they had two sons, Robert and St. Elmo Brady, Jr. who worked as a physician. St. Elmo Brady died on Christmas Day in 1966 Washington, D.C. He was 82. When West Virginia decided to quietly integrate its graduate schools in 1939, West Virginia State’s president Dr. John W. Davis selected Katherine and two male students as the first black students to be offered spots at the state’s flagship school, West Virginia University. 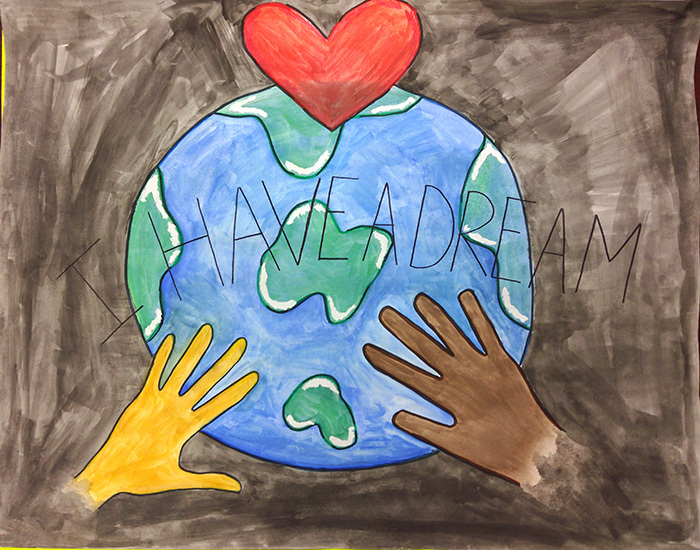 Katherine left her teaching job, and enrolled in the graduate math program. At the end of the first session, however, she decided to leave school to start a family with her husband. 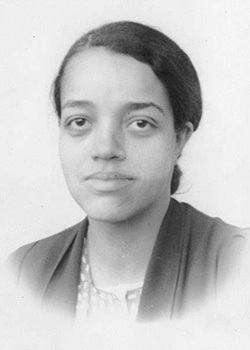 She returned to teaching when her three daughters got older, but it wasn’t until 1952 that a relative told her about open positions at the all-black West Area Computing section at the National Advisory Committee for Aeronautics’ (NACA’s) Langley laboratory, headed by fellow West Virginian Dorothy Vaughan. Katherine and her husband, James Goble, decided to move the family to Newport News to pursue the opportunity, and Katherine began work at Langley in the summer of 1953. Just two weeks into Katherine’s tenure in the office, Dorothy Vaughan assigned her to a project in the Maneuver Loads Branch of the Flight Research Division, and Katherine’s temporary position soon became permanent. She spent the next four years analyzing data from flight test, and worked on the investigation of a plane crash caused by wake turbulence. As she was wrapping up this work her husband died of cancer in December 1956. The 1957 launch of the Soviet satellite Sputnik changed history—and Katherine Johnson’s life. In 1957, Katherine provided some of the math for the 1958 document Notes on Space Technology, a compendium of a series of 1958 lectures given by engineers in the Flight Research Division and the Pilotless Aircraft Research Division (PARD). Engineers from those groups formed the core of the Space Task Group, the NACA’s first official foray into space travel, and Katherine, who had worked with many of them since coming to Langley, “came along with the program” as the NACA became NASA later that year. She did trajectory analysis for Alan Shepard’s May 1961 mission Freedom 7, America’s first human spaceflight. In 1960, she and engineer Ted Skopinski coauthored Determination of Azimuth Angle at Burnout for Placing a Satellite Over a Selected Earth Position, a report laying out the equations describing an orbital spaceflight in which the landing position of the spacecraft is specified. It was the first time a woman in the Flight Research Division had received credit as an author of a research report. 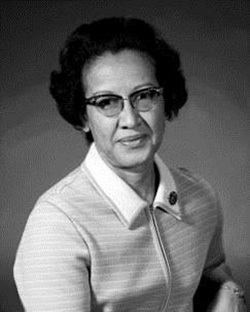 In 1962, as NASA prepared for the orbital mission of John Glenn, Katherine Johnson was called upon to do the work that she would become most known for. The complexity of the orbital flight had required the construction of a worldwide communications network, linking tracking stations around the world to IBM computers in Washington, DC, Cape Canaveral, and Bermuda. The computers had been programmed with the orbital equations that would control the trajectory of the capsule in Glenn’s Friendship 7 mission, from blast off to splashdown, but the astronauts were wary of putting their lives in the care of the electronic calculating machines, which were prone to hiccups and blackouts. As a part of the preflight checklist, Glenn asked engineers to “get the girl”—Katherine Johnson—to run the same numbers through the same equations that had been programmed into the computer, but by hand, on her desktop mechanical calculating machine. “If she says they’re good,’” Katherine Johnson remembers the astronaut saying, “then I’m ready to go.” Glenn’s flight was a success, and marked a turning point in the competition between the United States and the Soviet Union in space. In an era when NASA is led by an African American man (Administrator Charles Bolden) and a woman (Deputy Administrator Dava Newman), and when recent NASA Center Directors come from a variety of backgrounds, it's easy to overlook the people who paved the way for the agency's current robust and diverse workforce and leadership. Those who speak of NASA's pioneers rarely mention the name Dorothy Vaughan, but as the head of the National Advisory Committee for Aeronautics’ (NACA’s) segregated West Area Computing Unit from 1949 until 1958, Vaughan was both a respected mathematician and NASA's first African-American manager. Dorothy Vaughan came to the Langley Memorial Aeronautical Laboratory in 1943, during the height of World War II, leaving her position as the math teacher at Robert Russa Moton High School in Farmville, VA to take what she believed would be a temporary war job. Two years after President Roosevelt signed Executive Order 8802 into law, prohibiting racial, religious and ethnic discrimination in the country's defense industry, the Laboratory began hiring black women to meet the skyrocketing demand for processing aeronautical research data. Urgency and twenty-four hour shifts prevailed-- as did Jim Crow laws which required newly-hired "colored" mathematicians to work separately from their white female counterparts. Dorothy Vaughan was assigned to the segregated "West Area Computing" unit, an all-black group of female mathematicians, who were originally required to use separate dining and bathroom facilities. Over time, both individually and as a group, the West Computers distinguished themselves with contributions to virtually every area of research at Langley. The group's original section heads (first Margery Hannah, then Blanche Sponsler) were white. In 1949, Dorothy Vaughan was promoted to lead the group, making her the NACA's first black supervisor, and one of the NACA's few female supervisors. The Section Head title gave Dorothy rare Laboratory-wide visibility, and she collaborated with other well-known (white) computers like Vera Huckel and Sara Bullock on projects such as compiling a handbook for algebraic methods for calculating machines. Vaughan was a steadfast advocate for the women of West Computing, and even intervened on behalf of white computers in other groups who deserved promotions or pay raises. Engineers valued her recommendations as to the best "girls" for a particular project, and for challenging assignments they often requested that she personally handle the work. Dorothy Vaughan helmed West Computing for nearly a decade. In 1958, when the NACA made the transition to NASA, segregated facilities, including the West Computing office, were abolished. Dorothy Vaughan and many of the former West Computers joined the new Analysis and Computation Division (ACD), a racially and gender-integrated group on the frontier of electronic computing. 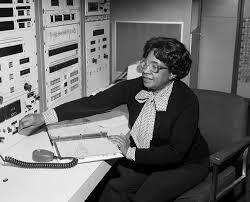 Dorothy Vaughan became an expert FORTRAN programmer, and she also contributed to the Scout Launch Vehicle Program. Dorothy Vaughan retired from NASA in 1971. She sought, but never received, another management position at Langley. Her legacy lives on in the successful careers of notable West Computing alumni, including Mary Jackson, Katherine Johnson, Eunice Smith and Kathryn Peddrew, and the achievements of second-generation mathematicians and engineers such as Dr. Christine Darden. For Mary Winston Jackson, a love of science and a commitment to improving the lives of the people around her were one and the same. In the 1970s, she helped the youngsters in the science club at Hampton’s King Street Community center build their own wind tunnel and use it to conduct experiments. “We have to do something like this to get them interested in science," she said in an article for the local newspaper. "Sometimes they are not aware of the number of black scientists, and don't even know of the career opportunities until it is too late." Mary’s own path to an engineering career at the NASA Langley Research Center was far from direct. A native of Hampton, Virginia, she graduated from Hampton Institute in 1942 with a dual degree in Math and Physical Sciences, and accepted a job as a math teacher at a black school in Calvert County, Maryland. Hampton had become one of the nerve centers of the World War II home front effort, and after a year of teaching, Mary returned home, finding a position as the receptionist at the King Street USO Club, which served the city’s black population. It would take three more career changes—a post as a bookkeeper in Hampton Institute’s Health Department, a stint at home following the birth of her son, Levi, and a job as an Army secretary at Fort Monroe—before Mary landed at the Langley Memorial Aeronautical Laboratory’s segregated West Area Computing section in 1951, reporting to the group’s supervisor Dorothy Vaughan. Mary Jackson began her engineering career in an era in which female engineers of any background were a rarity; in the 1950s, she very well may have been the only black female aeronautical engineer in the field. For nearly two decades she enjoyed a productive engineering career, authoring or co-authoring a dozen or so research reports, most focused on the behavior of the boundary layer of air around airplanes. As the years progressed, the promotions slowed, and she became frustrated at her inability to break into management-level grades. In 1979, seeing that the glass ceiling was the rule rather than the exception for the center’s female professionals, she made a final, dramatic career change, leaving engineering and taking a demotion to fill the open position of Langley’s Federal Women’s Program Manager. There, she worked hard to impact the hiring and promotion of the next generation of all of NASA’s female mathematicians, engineers and scientists. Mary retired from Langley in 1985. Among her many honors were an Apollo Group Achievement Award, and being named Langley’s Volunteer of the Year in 1976. She served as the chair of one of the center’s annual United Way campaigns, was a Girl Scout troop leader for more than three decades, and a member of the National Technical Association (the oldest African American technical organization in the United States). She and her husband Levi had an open-door policy for young Langley recruits trying to gain their footing in a new town and a new career. A 1976 Langley Researcher profile might have done the best job capturing Mary Jackson’s spirit and character, calling her a “gentlelady, wife and mother, humanitarian and scientist.” For Mary Jackson, science and service went hand in hand.